Summary: Learn how to add a doorway, build a timber partition wall, construct a masonry loadbearing wall and install a timber stud loadbearing wall. Creating a doorway will involve knocking through an existing wall. Great care must be taken before starting any type of major work on the walls of a building. Before making a hole in a wall, you need to ascertain whether the wall is loadbearing and integral to supporting the ceiling and floor above. If the wall is loadbearing, it will need to be supported by lintels. 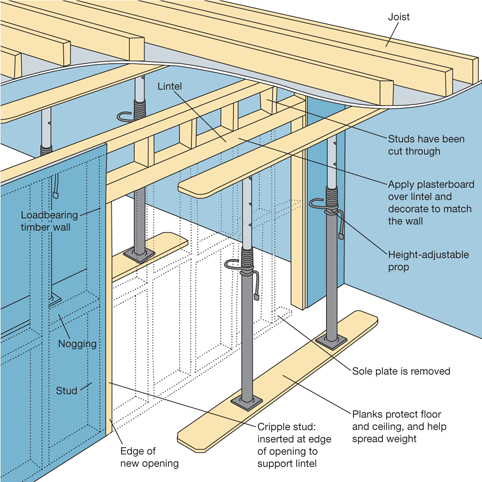 If floor or ceiling joists run at right angles to the wall it may indicate it is supporting their weight. If in any doubt consult a structural engineer or professional builder to determine whether the wall is loadbearing and what level of support will be needed if it is. You should also check for electrical wires and pipes behind the wall in the planning stages of the project. A cable and pipe detector can be used for this purpose. A partition wall has no structural significance and requires no support but you should still check for pipes and cables. If pipes or cables are detected they will have to be rerouted. Mark out the area of the doorway on the wall, using an existing stud as the hinging edge for the doorway. Use a drywall saw (padsaw) to sut out a hole large enough to locate the position of any cables or pipes. Pull away the plasterboards with a crowbar. Cut through the vertical studs and horizontal noggings with a panel saw to remove them. Using a crowbar, lever up the sole plate attaching the frame to floor joists. Insert timber noggins between the sawn-off studs over the opening. Fix a new stud opposite the existing stud to frame the opening. 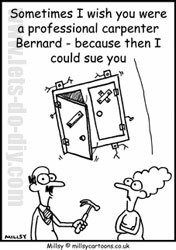 A doorset can now be fixed in the opening. If the wall is masonry, you will need to insert timber supports, called needles, into the brickwork above the opening, which will rest on props to support the weight of the wall. When cutting into masonry wear protective goggles and a mask, and ensure the room is well ventilated. Make the holes for the needles using a club hammer and bolster chisel at 1 metre (3ft) intervals or as specified by a structural engineer. Push the needle through the holes so they project at an equal distance on each side of the wall. Place height-adjustable props under the needles to support the weight of the wall above the opening. The prop should stand on planks to distribute the weight. Using a club hammer and bolster chisel cut out enough brick to insert a lintel along the top of the opening. 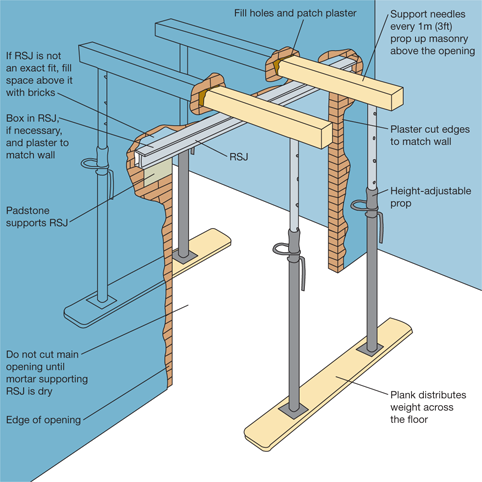 The lintel should be longer than the opening and may take the form of a beam or RSJ (rolled steel joint). To support the lintel in place, fix padstones onto the brickwork at either end with mortar. Thick walls may require two lintels, one on either side of the wall. When these have set firmly, spread mortar on top of the padstones and rest the lintel on them. Check the lintel is level using a spirit level before allowing the mortar to set. Once the lintel has set, cut out the remaining area of the opening. Use an angle grinder to make neat cuts around the perimeter of the opening. Chip away plaster with a club hammer and bolster chisel to expose the bricks at the top of the wall. Remove bricks course by course from top to bottom. Use a club hammer to drive the chisel into the joints between bricks along the top of the wall, loosening the mortar. Once any loose half bricks or blocks at the edges of the opening have been secured in position with mortar, a door set can be fixed in the opening. Use a detector to locate any pipes and cables behind the wall. If any are detected they will need to be rerouted. Mark out the width of the doorway on the wall, using an existing stud as the hinging edge for the doorway. The plasterboard will have to be removed from floor to ceiling. Erect height-adjustable props on both sides of the wall ensuring they run at right angles to the joists (if the joists are running in the same direction as the wall you will need to seek professional advice). Planks should be positioned under and above the props to protect the floor and ceiling. Cut through the plasterboard with a drywall saw. Use a panel saw to cut through the timber studs and noggins. Cut through the sole plate at the base of the wall and use a nail bar to lever it free. Once you have made the opening, fit a ‘cripple stud' to both edges of the opening. This will support the timber lintel. At the top of the opening fit the horizontal timber lintel or beam in position with each end supported by the ‘cripple studs'. The area above the opening can now be covered with plasterboard. A doorset can now be fix in the opening. Join an existing conversation or create a new thread related to Woodwork in our DIY forum.